Clyde Young who was one of the earlier owners of the Winery property when it used to be a family farm in the early 1900's. The cost is $130 per couple. What a deliciously romantic way to spend an evening, don't you think? If you are interested you can call 207 763-4290 for reservations. The real Clyde is pictured here in the center on a wagon, with his father Winfield Young and his brothers Albert and Bradford. His mother stands in the doorway. 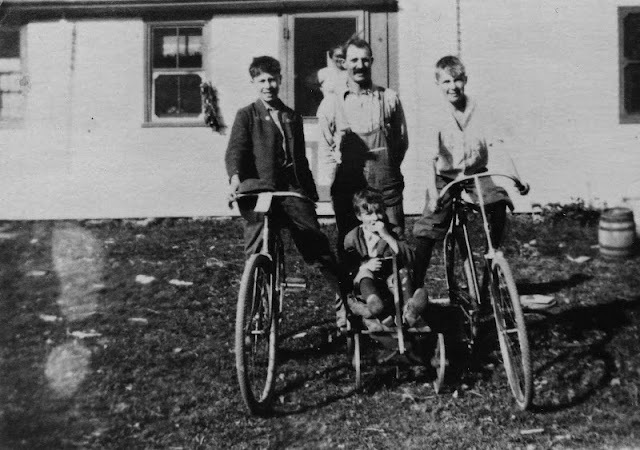 The photo was taken by sister Ellen around 1921 at the family farm which is now the Cellardoor Winery in Lincolnville, Maine. Overlooking the Vineyard at the Cellardoor Winery. This is Clyde, the 1923 Model T with owner Bettina Doulton (L) of Cellardoor Winery, MaryAnn Mercier owner of Youngtown Inn and local Historian Rosey Gerry at the wheel.